Drummer Levey surrounded himself with some of California’s finest for his leader album on Bethlehem. The opening track “Yesterdays” is a feature piece for Frank Rosolino who takes full advantage with the crisp rhythm section motoring along behind him. An extraordinarily gifted trombonist, he was both technically fluent and inventive and this solo is one of his finest and most complex. It is Richie Kamuca’s turn next to be highlighted in solo on “Angel Cake”, a line written by Sonny Clark who provides a flowing solo and accompaniment. Clark made his considerable reputation living in NYC and recording for Blue Note between late 1957 and 1962 but it is often forgotten that he lived and played in California during the early to mid- 1950s. His hard-swinging, percussive comping and flowing solos added considerably to many a West Coast session and this is no exception. Marty Paich arranged “Why Do I Love You” for the sextet, taken here at a fast clip managed and controlled by Levey’s drums and the bass of Vinnegar and Clark’s rhythmic piano lines. “Blues at Sunrise” was arranged by Clark and he gives fine backing to Conte Candoli who is featured on trumpet. “Hit That Thing” is the only track to put the leader in the spotlight and he takes a well-constructed extended drum solo. The other pieces feature all the frontline soloists including a neat chart by Bill Holman on the old pop “A Gal in Calico”. There are some good solos, one or two fairly basic and uninspired ones although the top-class rhythm section is on form all through. 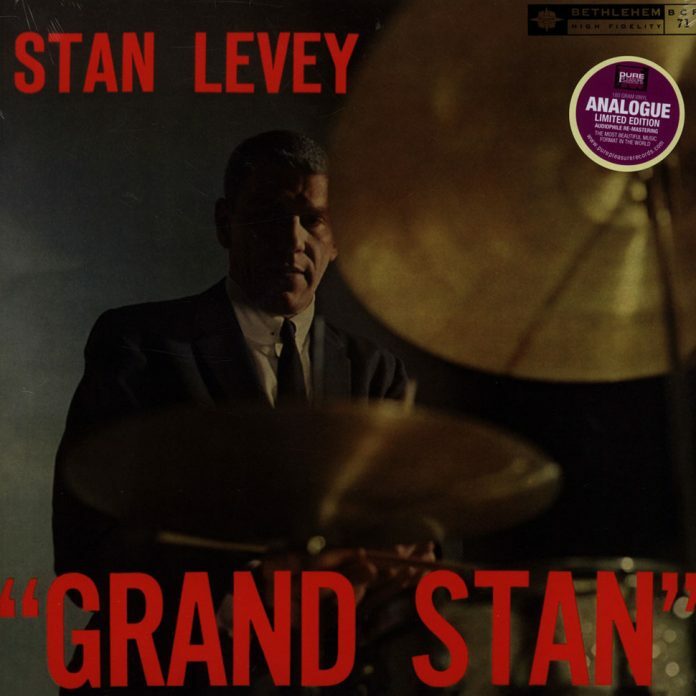 Levey’s solid drumming, the top quality soloists and general style of play owes more to the east than the west coast. The recording is not the best but is enhanced by good mastering and high-quality vinyl from Pure Pleasure Records. The cover is an exact reproduction of the original Bethlehem LP. Conte Candoli (t); Richie Kamuca (ts); Frank Rosolino (tb); Sonny Clark (p); Leroy Vinnegar (b); Stan Levey (d) Hollywood, November 1956. "Levey surrounded himself with some of California’s finest for his leader album on Bethlehem".